Just came back from a trip to pickup a new router for the house since the one we got is going bad and doing weird things. Also picked up a mouse for my new laptop (more to come on this). 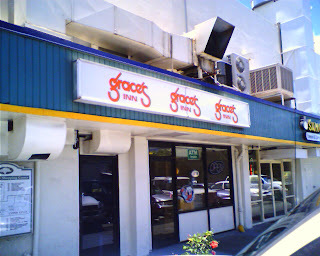 Decided to get some food on the way back and so I stopped at Graces (see pic) in Kapahulu. Shoyu Roast Pork plate all rice for lunch. Just sitting here waiting for it and decided to drop a quick note to the new blog since it is too long for a Tweet. Hahaha. UPDATE: Here is what my plate lunch looked like right before I scarfed the whole thing down in record time. Boy am I full now! But sure was an ONO lunch! Didn’t quite finish the last scoop of rice completely, but enough of it to make it too much for sure. Heh.